Create a long-lasting, unfussy flower bed by growing perennials. Perennial flowers have foliage and flowers that continue to blossom year after year. They are tough, hardy plants that are sometimes deer and drought resistant--every gardener’s dream. Tucked along the front or sides of a flower bed, perennials are an ideal way to bring splashes of interesting colors and textures to the garden. This summer blooming perennial looks striking along the flower bed for bright bursts of color. Low-mounding in form, coreopsis flowers bloom in yellow and gold for warm color along the garden. Coreopsis prefers well-drained, dry soils and is a preferred flower to grow in arid, dry climates where temperatures soar. Coreopsis grows between 9 to 18 inches in height and prefers full sun to partial shade. The leaves are thread-like and fine against the colorful blossom. Pinch back the spent coreopsis blooms to ensure fresh blooms throughout the season. The USDA Hardiness Zone for this plant is 3 to 9. Another hardy perennial flower to grow among the flower bed is lavender. This fragrant and long-lived flower produces beautiful foliage year after year. The compact form and purple flowers of lavender are ideal planted in rows along the bed. Lavender prefers well-drained, alkaline soils to flourish. It grows up to 36 inches in height, perfect for an aromatic touch or clipped for a small bouquet. Lavender is also a sun-loving perennial with a USDA Hardiness Zone of 5 to 9. This unfussy, tough perennial is a gardening must. The drought tolerant blooms sprout back every year for a long lasting flower bed addition. 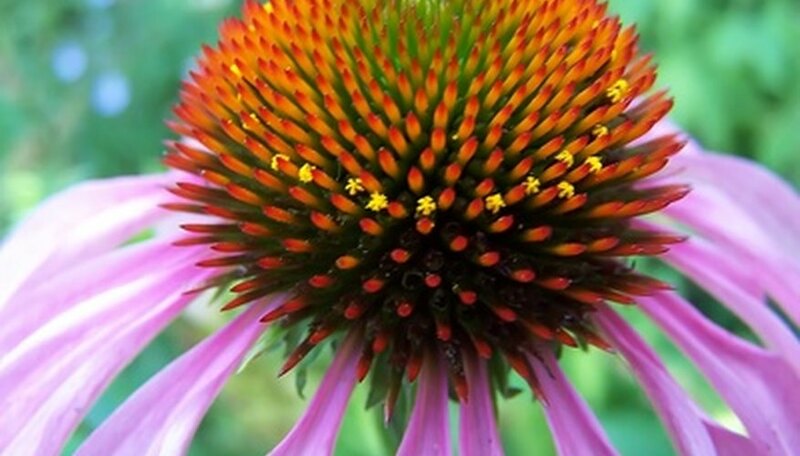 Coneflowers grow 2 feet in height and have large flower blooms that grow 4 inches wide. These sun-loving, colorful perennials have dome-shaped centers that are brownish orange in color. The upright, straight stems grow in clumps for a robust shape to the garden bed. Flowering begins in late spring and lasts through the first frost, making for a long blooming period. Coneflowers are ideal planted along the outskirt of the bed to help define the space with its billowing shape. They also make great fresh cut flowers to use in arrangements. The USDA Hardiness Zone for the coneflower is 3 to 8. A late spring blooming perennial, verbena is ideal along the flower bed because of its spreading ability. In sunny, well-drained areas its blooms brighten up the space. Bloom colors include purple white, pink and red. Verbena grows between 8 to 18 inches in height and blooms until cool fall weather. This bright perennial also attracts butterflies to the flower bed. TVerbena grows well in USDA Hardiness Zones 6 through 10.